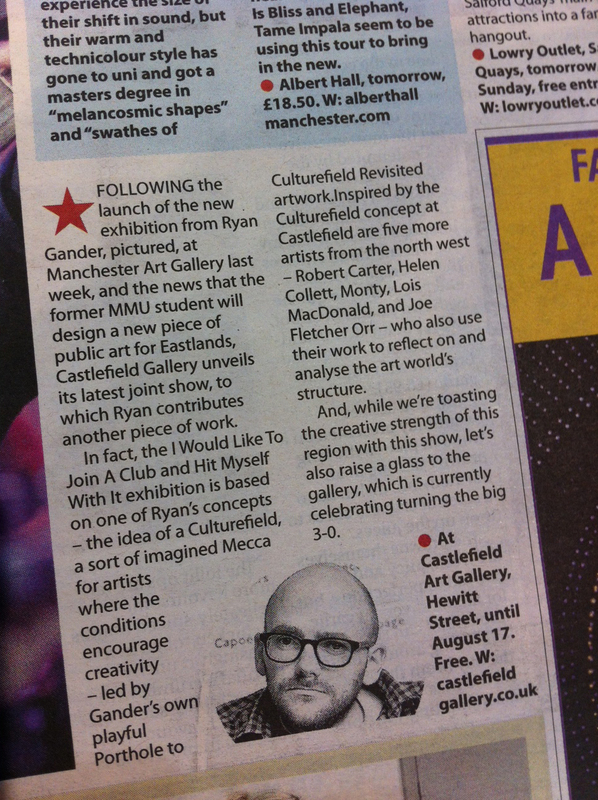 Castlefield Gallery (CG) is delighted to present its annual Head to Head exhibition; I Would Like to Join a Club and Hit Myself with It. CG is working with Manchester Art Gallery to explore the concept of Culturefield, artist Ryan Gander’s imagined place with the perfect conditions for creativity. The exhibition coincides with the renowned British conceptual artist’s major solo exhibition, Make every show like it’s your last, at Manchester Art Gallery (3 July – 14 Sept 2014). With his piece Porthole to Culturefield Revisited, that will be shown at CG, Gander suggests the value of keeping a place like Culturefield in mind as a source of creative energy, even though it may be forever out of reach. Alongside Porthole to Culturefield Revisited, CG will present new work by Robert Carter, Helen Collett, Monty, Lois MacDonald, and Joe Fletcher Orr, five Northwest–based artists who like Gander, continually restructure, critically yet positively, the many art worlds they find themselves working within. Gander’s complex and unfettered conceptual practice is stimulated by queries, investigations or what-ifs, rather than strict rules or limits. For example, what if Degas’ Dancer could step down from her plinth, remove her tutu and explore the exhibition space that surrounds her. Or, what if the government’s Department for Business, Innovation & Skills (BID) ran a campaign encouraging imagination among the British population, an idea that will be explored in Imagineering, 2013. The works on display will also highlight Gander’s multidisciplinary process. Similarly Carter, Collett, Monty, MacDonald, and Orr each deal with ideas and work across a range of mediums, realizing their work in a variety of forms with the exhibition at CG including everything from a neurological examination of flies, to buying and investing in fine wine. This exhibition is an opportunity for CG to continue its 30 years of exhibiting early-career artists alongside artists of international standing, providing artists with the support, time and space necessary for them to develop experimental and risk taking art. However, this Head to Head exhibition not only puts the artists and their work into dialogue but also highlights the relationship between CG and Manchester Art Gallery, and the role that each play in the contemporary art ecology. 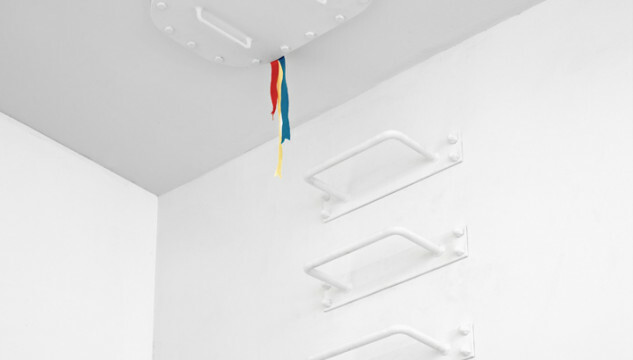 Ryan Gander (b. 1976 in Chester) received his undergraduate degree from Manchester Metropolitan University’s BA (Hons) Interactive Arts course in 2000. He lives and works in London. Recent solo exhibitions include FRAC Île-de-France / Le Plateau (2013); Palais de Tokyo, Paris (2012); Museo Tamayo, Mexico City (2012); Haus Konstruktiv, Zurich (2010); Solomon R Guggenheim Museum, New York (2010; Ikon Gallery, Birmingham (2008); the Stedelijk Museum Bureau, Amsterdam (2007 & 2003); MUMOK, Vienna (2007) and the CCA Wattis Institute for Contemporary Arts, San Francisco (2007). He has also shown in group exhibitions such as the Shanghai Biennale (2012); documenta 13, Kassel (2012); ILLUMInations, 54th Biennale di Venezia, Venice (2011); 55th Carnegie International, Pittsburgh (2008) and the Sydney Biennial (2008). Ryan Gander has been awarded numerous prestigious prizes, among others the Zürich Art Prize (2009), the ABN Amro Art Price (2006), the Baloise Art Statements of the Art Basel (2006) and the Dutch Prix de Rome for sculpture (2003). Current exhibitions include Chance Everything, 18 April – 6 July, Mostyn, Wales and Per/Form, 23 March – 21 September, CA2M Madrid. Robert Carter is a designer and curator based in the NW. He has worked with a number of artist led projects including Auto Italia South East, London; Malgras|Naudet, Manchester and Lionel Dobie Project, Manchester. Carter is currently co-curating a six month pilot program at The Exhibition Centre for the Life & Use of Books, Salford. Helen Collett is an artist/curator based in Manchester, UK. She is interested in the allusions/interventions between different art roles/structures and how/why most contemporary practitioners occupy several at once. She is also one half of collaborative project Helen-Lois, who worked on Lionel Dobie Project – a 14 month project focusing on live curatorial research. Lois Macdonald is an artist/curator based in Manchester working with video, performance and new media. As an artist Macdonald’s work is often influenced by current events and trends, and comes with a DIY approach which is reflected in her aesthetic. She is the other half of collaborative project Helen-Lois, who worked on Lionel Dobie Project – a 14 month project focusing on live curatorial research. Lois is based in Manchester. Monty lives and works in Manchester. He has had work exhibited as part of group exhibitions at TheInternational 3, Manchester; Rogue Project Space, Manchester; and Islington Mill, Salford. Monty is the founder of Toast an artist led space that hosts artists residencies and exhibitions in Manchester. Joe Fletcher Orr is the founder of Cactus an artist run space in Liverpool. He graduated from the BA Fine Art course at Manchester School of Art in 2013. He has been part of group exhibitions at Rogue Project Space, Manchester;The International 3, Manchester; Toast, Manchester; Oriel Sycharth Gallery, Wrexham; Sluice art fair, London; Malgras|Naudet, Manchester; Ceri Hand Gallery Summer Fete, London; The Florence Trust, London. Lois Macdonald, Audio Tour #1 : Join the Club, 2014 offers audio clips from key points and brief conversations with the artists during the install, alongside complimentary sound effects and additional audio for visitors to listen to as they walk round the exhibition.